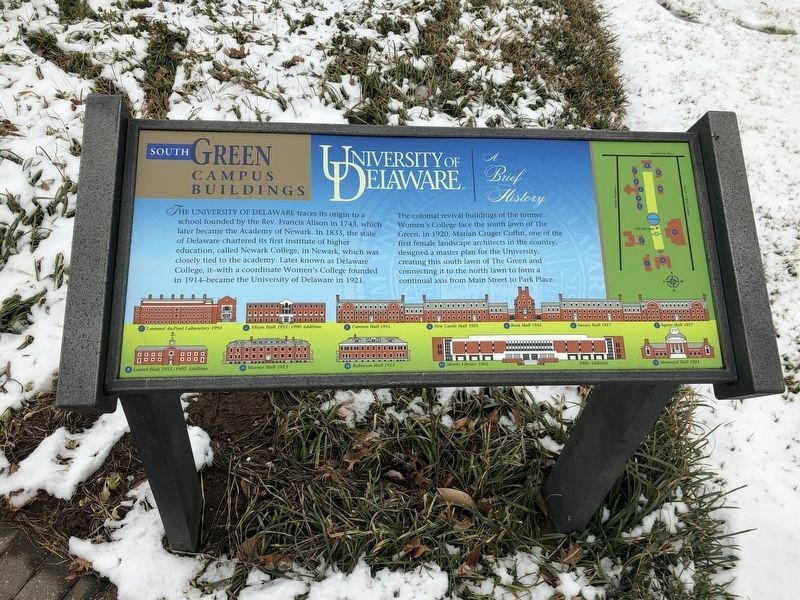 The University of Delaware traces its origins to a school founded by the Rev. Francis Alison in 1743, which later became the Academy of Newark. In 1833, the state of Delaware chartered its first institute of higher education, called Newark College, in Newark, which was closely tied to the academy. Later known as Delaware College, it—with a coordinate Women's College founded in 1914—became the University of Delaware in 1921. The colonial revival buildings of the former Women's College face the south lawn of The Green. In 1920, Marian Cruger Coffin, one of the first female landscape architects in the country, designed a master plan for the University, creating this south lawn of The Green and connecting it to the north lawn to form a continual axis from Main Street to Park Place. Location. 39° 40.661′ N, 75° 45.132′ W. Marker is in Newark, Delaware, in New Castle County. Marker is on The Green. Touch for map. Marker is at or near this postal address: 279 The Green, Newark DE 19716, United States of America. Touch for directions. Other nearby markers. At least 8 other markers are within walking distance of this marker. The Magnolia Circle (within shouting distance of this marker); Hugh Martin Morris (1878-1966) (within shouting distance of this marker); Annie Jump Cannon (1863-1941) (about 300 feet away, measured in a direct line); Rev. Dr. Francis Alison (1705-1779) (about 400 feet away); Lammot du Pont Laboratory (about 400 feet away); Winifred J. Robinson (1867-1962) (about 400 feet away); Memorial Hall (about 400 feet away); New Castle Hall (about 400 feet away). Touch for a list and map of all markers in Newark. Credits. This page was last revised on March 4, 2019. This page originally submitted on March 2, 2019, by Devry Becker Jones of Washington, District of Columbia. This page has been viewed 37 times since then. 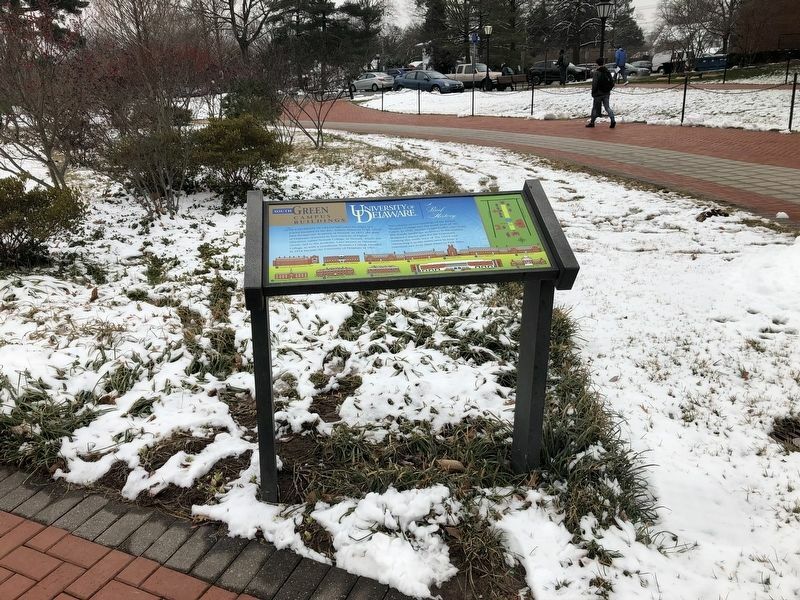 Photos: 1, 2. submitted on March 2, 2019, by Devry Becker Jones of Washington, District of Columbia. • Bill Pfingsten was the editor who published this page.